There comes a time in the life of every Quaffmaster when he or she* must, like a spawning salmon, return to the waters of his or her** birth***. Feeling this soul-deep summons, I persuaded the Lab staff that it was time for us to make a journey from Vista, California to Topeka, Kansas. And what better way to cross the great American southwest desert in late July/early August than by driving across it? Having agreed that this was the best plan of all possible plans which have ever been planned, we rented a car*****, loaded up a lot of stuff, and set course for the town where I spent the first eighteen years of my life. By a somewhat indirect route, of course. Why take a road trip if you're not going to see some stuff? In this case, "some stuff" included Las Vegas, chicken fried steak, unexpected summer desert rainstorms, the Great Salt Lake, the Temple Square, our life flashing before our eyes on a Utah interstate merging, Dinosaur National Monument, a vague view of I-70 through a curtain of rain and mist as we skidded down the Vail Pass in a driving rainstorm, giant voyeuristic bears, warm greetings and yummy food from dear family, another friend who I had only ever spoken to online, several hours' worth of the inside of a tire repair shop in Estes Park, unexpected waterfalls, wrong turns, wind farms, Kanorado, giant stone phalluses, decadently huge sandwiches, sphinxes, and (most recently) dominoes. And, not entirely unexpectedly given who I am, Weird soda. As we strolled through the North Topeka First Friday Art Walk, a bag containing a highly artistic wire sculpture of an octopus swinging merrily from my arm, my eyes chanced across a street cart at which beverages were being vended. The cart bore the logo of SodaWorks, a Topeka company I had only heard of, which sold Weird sodas. This meeting was clearly destined, and so I strode boldly forth to peruse their wares. Not only did they have wit as sparkling as their beverages, they had two I had never even heard of before. Obviously, I had to purchase these and report on them for you, my readers******. So with my hat off to SodaWorks, let's get to the quaffing. Appearance: We should start with the bottle. It rests upon the table where I ate dinner in my childhood. I think I kind of looked like that at the time, too. This one is from Orca Beverage Soda Works, which I note is based in Mukilteo, Washington. Any town which combines the concepts of "mucus" and "kilt" in its name has got to be some place special. The person depicted on the bottle is cherubic and partially bald. What hair he (I am presuming "he") has is swept dramatically back from the widow's peak on his forehead. His tongue, protruding tentatively from his lips, suggests that he is either licking his lips in anticipation of the drink or giving a raspberry to the year 1934. 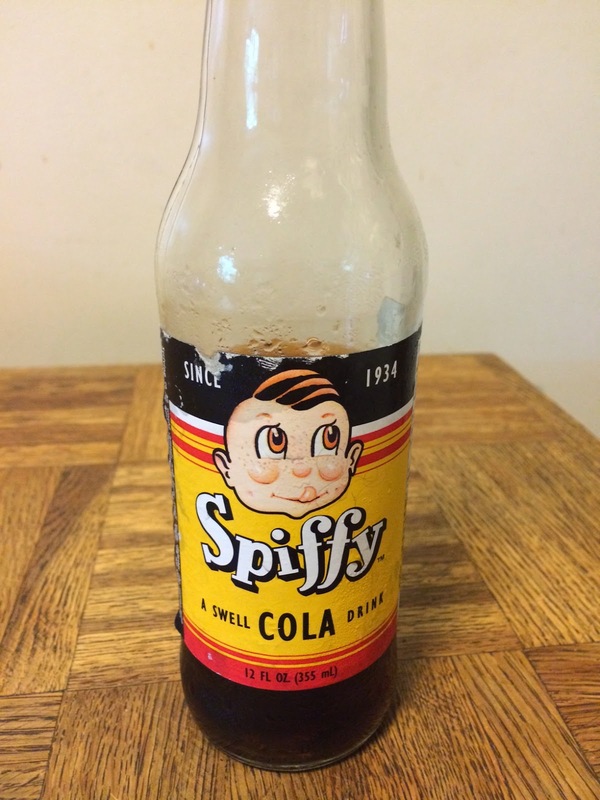 My father (who shall be known as Cliffhanger) was born in 1933, so I am presuming that Mr. Spiffy, here on the bottle, is expressing his disdain for any year following the year of Cliffhanger's birth. "Baloney, you chizz! ", says Mr. Spiffy, "No gin-fizz or giggle juice can eighty-six the macher which is Cliffhanger! Why, I'm starry-eyed at his moxie! But I'm just bumping gums here, cat. Abyssinia!" Now, the appearance of the soda itself. Appears to be a dark caramel-colored cola, similar to any number of others. Aside from the smooth Joe on the label, it doesn't seem too unusual. Scent: Fairly sharp cola, citrusy undertones. Maybe some vanilla. A nice smell. Taste: First attack is sweeter than some colas, with little of the aggressive bite that you get in more common sodas. Followed quickly by a very sharp tartness, "orange-ish or slight lemon" in Nazgul's opinion which dissolves into a pleasant series of aftertastes. The aftertaste has a lot of root beer-like notes, cinnamon and vanilla. Cliffhanger: "Characteristic cola taste at the beginning, with a citric highlight in the aftertaste." Of course, Cliffhanger can actually distinguish between wines, so his palate is more trustworthy than mine. The fact that we broadly agree makes me think I might have some hope for myself. Or that I should have more wine. Colas aren't my favorite sodas, although I can enjoy them when they are what's at hand. This is an unusually nice cola; smooth, without a lot of bite, and with some complexity. Nazgul is also fond of the not-quite-as-carbonated quality, which probably helps with the smoothness. Quaff rating: 3.5. Good stuff. Cough rating: 0.5. Other than the very powerful citrus attack in the mid-taste, no objections from me! Executive: "Ladies and gentlemen, we have a new soda to sell. What do we call it?" Marketing Person: "We're not sure yet. We're looking for ideas." Underling: "Let me try some. We can base the name on the flavor." Executive: "Very well. Stormtroopers! Get this underling a bottle of the latest brew!" Underling: "HOLY %#@! *& THAT IS THE BEST %$#*ING SODA I HAVE EVER HAD"
Executive: "Genius! Let's go with that!" I must admit that the original title is better, but one must make allowances for the desire to not be arrested. Appearance: A slightly lighter caramel than the Spiffy, but still pretty much brown. This is the table where I ate family meals for most of my pre-adult life. Coming back and doing Weird soda reviews on it feels a bit weird. Scent: Interesting. The butterscotch is right on top, masking most of the root beer smell. It's a bit darker than, say, butterscotch chips or those hard yellow butterscotch candies, but it's pretty clear. Taste: This is an interesting combination. The butterscotch isn't as strong in the taste as in the smell. It's balanced almost perfectly with the root beer, and the balance is nice. The butterscotch has an ever-so-slightly burned note, as if aged in oak barrels which, just prior to being breached, were shipped to a dungeon room in which a party of eighth-level adventurers encountered an adult red dragon********. On the other hand, the good part of root beer is in the complexity of the mid- and aftertaste, and that is completely lost here. The butterscotch masks it completely, fading out slowly, without ever letting it get through. It's either a very poor root beer, or it's lost in the butterscotch; either way, I am sad. Oh, wait. About ten seconds after quaffing, there's a bit of mild ickiness. A slight bitter-metallic aftertaste, and a feeling of light coating on the roof of the mouth which persists. Unpleasant. 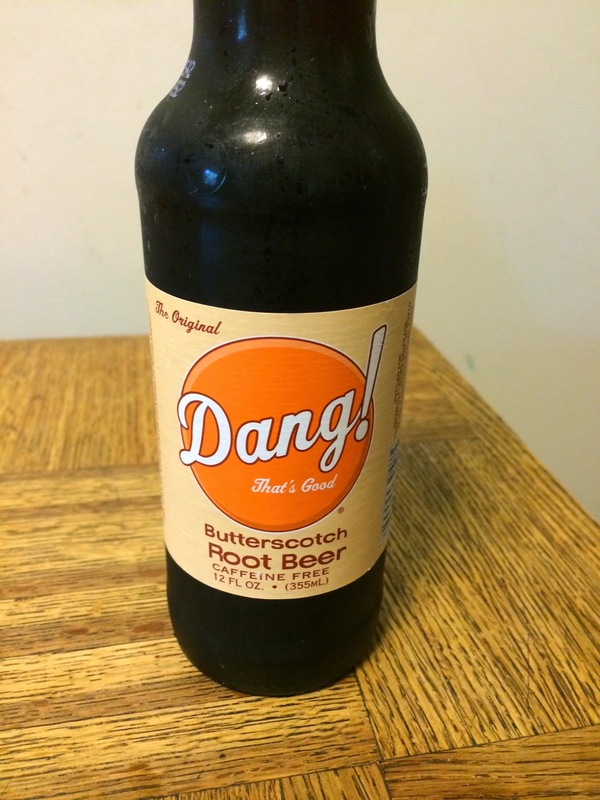 Overall, while the butterscotch is fun (and I admire the balance with the basic root beer flavor), this is disappointing. Quaff rating: 2.5. Meh. Good but not really good. Cough rating: 1.0. There is noticeable aversive stuff in the aftermath. Our work here is done. Time to leave Topeka, and journey back to the Lab. Abyssinia! * In this case, "he". ** In this case, "his". *** My mother, Rotalmomska, did not save any of the amniotic fluid in which I gestated****, so this should be taken metaphorically. ***** Had we not done this, our choices from the Lab auto pool would have been a 1994 Ford Aspire (no power steering, effectively no air conditioning, and a vestigial back seat) or a 1998 Toyota Sienna minivan (on which I have been practicing effectively nonexistent automotive maintenance skills, and also lacking effective air conditioning). There is no price that the rental car company could have charged us which would not have been worth it. ****** I am told that the chance of any given person reading this blog is nonzero. Since nonzero is infinitely greater than zero (I know this is mathematically unsound), I conclude that not only is it certain that every single person on Earth is a reader of this blog, but also that the existence of information describing this blog has reached Alpha Centauri by now, and so all sentient beings there are also readers. 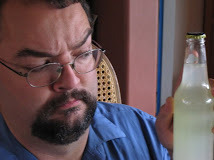 As Earth's ambassador to alien species, I offer my sincerest apologies for Abali Yogurt Soda. ******* Actually, I can think of any number of other descriptors. You probably can, too, but I doubt I want to hear them. ******** While "800 XP" is not specifically listed in the ingredients, I think I can taste it.